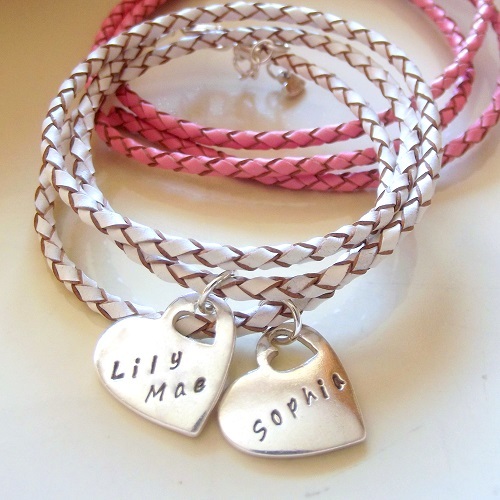 This braided leather wrap bracelet is a relaxed and on trend way to wear your personalised jewellery. A gorgeous keepsake bracelet for that special someone to treasure and a stunning gift for birthdays, anniversaries or to celebrate the birth of a new baby. Wrapping 3 times around the wrist to be secured with a sterling silver clasp and extender chain featuring a tiny fine silver hammered heart. The 99.9% pure silver heart charm is personalised with the name of your choice and attached to your bracelet (maximum 7 characters, unless the name can be split as shown). Available in white, soft pink or grey with a choice of 2 sizes. 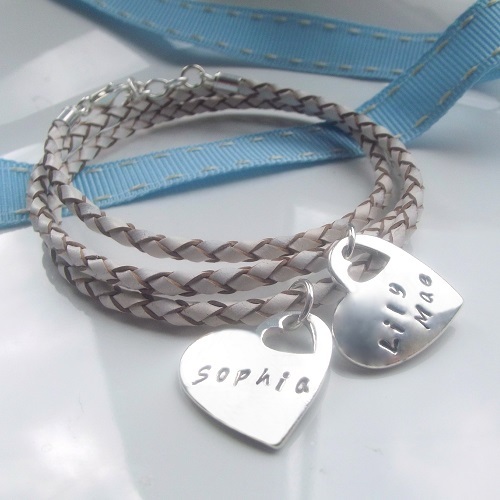 A second charm can also be added to further personalise your bracelet. Please note that each bracelet is made to order and names are stamped by hand not machine engraved, therefore any differences/irregularities should be appreciated as part of the charm of a handmade and unique item.